Putting a sign up in front of your store is one way to try and convince potential customers to visit your business, but it’s not the only way to do it. Many companies in the Indianapolis and Greenfield areas have found that installing awnings is another great way to bring in business. Commercial awnings serve a very practical purpose, as they are designed to provide shelter to those who stand outside of businesses. But your business can also install awnings with signage on them that will help to advertise your business and let people know what you are all about. 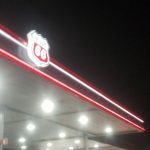 Greenfield Signs & Lighting specializes in installing commercial awnings, lighted awnings, awnings with signage, architectural awnings, and custom awnings for clients in Indianapolis, Greenfield and throughout Indiana. Awnings have come a long way over the years. Once upon a time, most of these awnings were made out of fabric and would weather and age over time. While you can still purchase commercial awnings made out of fabric, there are also more durable materials that are used to create many of the custom awnings used by businesses today. Additionally, architectural awnings can give your business a higher-end look and attract a certain kind of customer to pay you a visit. It’s really all about picking the right commercial awnings for your situation and using it effectively to encourage people to visit your business. 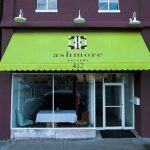 Adding an awning can also be a great benefit to any business that takes advantage of the seasons to cater to customers. Outdoor serving areas are incredibly popular at many restaurants, and shops and retailers can plan sidewalk sales or outdoor events in front of their businesses, protected in the shade of an awning. Awnings also help protect customers as they come and go from your business during inclement weather, and can even offer energy savings by shading windows that would otherwise receive full sunlight, driving up air conditioning costs in the summer months. 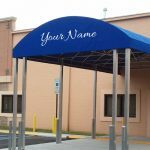 Choosing the right commercial awning with signage can be a difficult task for some business owners. 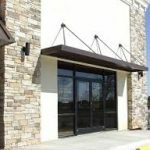 If commercial awnings aren’t designed and installed properly, they could actually backfire and block the front of a business, thereby hiding it from the potential customers driving or walking by. But Greenfield Signs & Lighting can sit down with you at your Indianapolis or Greenfield business and listen to your awning ideas and suggest some of our own. We are a family owned and operated business and take pride in our ability to deliver quality commercial awnings to those looking to improve their businesses in Indiana. When you put up custom awnings designed by us, they will generate more sales, get more people talking about your business, and improve the entire look of your store from the outside. Call Greenfield Signs & Lighting at 866-740-9797 to discover why so many businesses in Indianapolis and Greenfield have trusted us to install commercial awnings for them.